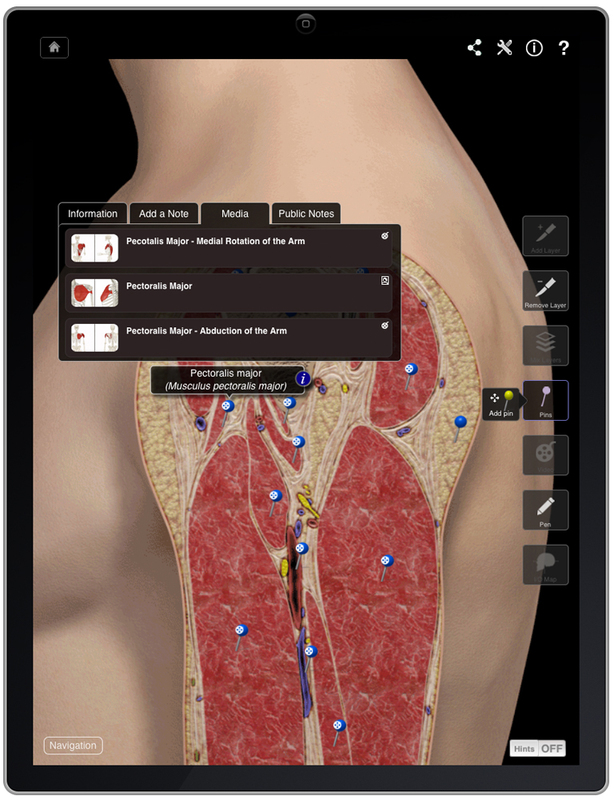 Next generation of anatomy apps for learning and patient education here NOW!! Regular readers of the blog may remember the previous post on anatomy applications (apps) back in June last year, when I presented my top 5 anatomy apps on the Apple apps store for both learning anatomy and educating patients. For those of you who need a quick reminder, apps from the Apple store are computer programs that work on several Apple-platform mobile devices including iPads, iPhones and the iPod touch, with certain apps and features within apps being available only on certain devices, limited only by hardware and next generation development issues. For example, the iPad 2 has an integrated camera whereas the first generation device had none. 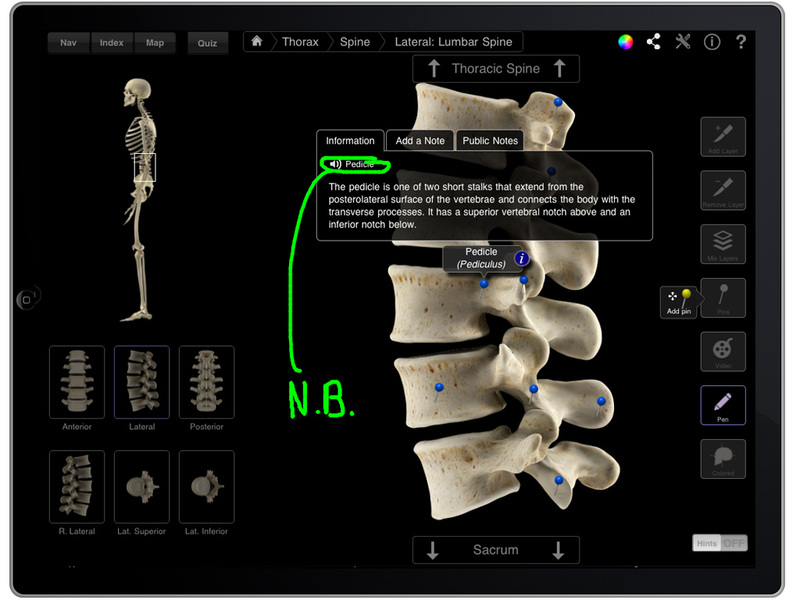 The value of anatomy apps lies both within clinician and patient education. 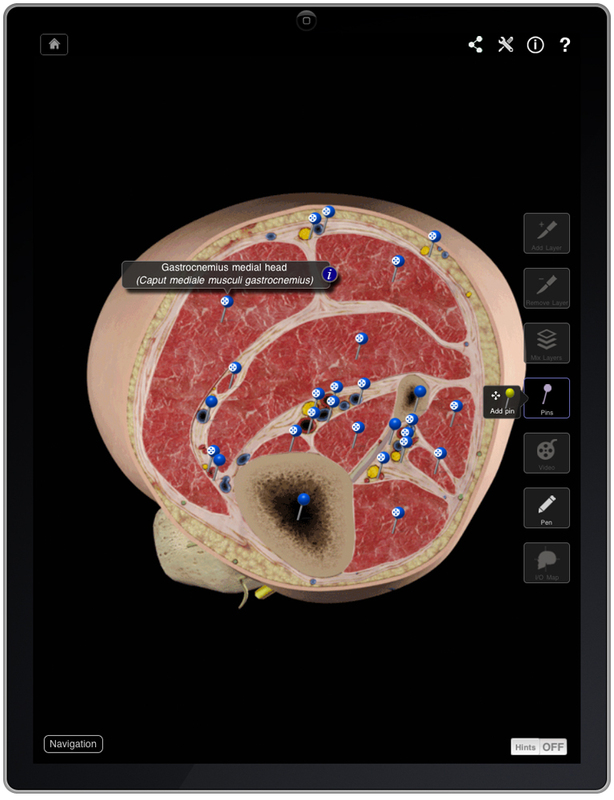 The next generation of anatomy apps are now available from 3D4Medical, running on both first and second generation iPads. There are updates for both of the Skeletal System and Muscle System Pro Nova apps (now in their 3rd editions), and new dedicated apps for the hip joint, knee joint and shoulder joint which include the complete anatomy of these regions including musculoskeletal anatomy, nervous system and vascular anatomy. I am pleased to say that there has been a significant improvement to the existing apps which were already excellent in quality. Now, they are simply outstanding in many ways. The quality of the visuals has not gone unnoticed by Apple themselves who have showcased some of the apps on their latest TV adverts. The images really are stunning when seen on the iPad. Both Skeletal and Muscle System Pro Nova III apps come with a new interface which allows for simpler navigation. Images can be more easily manipulated than before for different viewing angles allowing for simpler rotation, single finger-swipe cuts for coronal, saggital and transverse views, and a double-tap zoom feature. This allows you to get to the images you really want to see much quicker than before. There is a hint feature to help you to get to grips with the new graphical interface features which can be turned off once you get used to these. Pin Media labels are more extensive, and these are now spoken to allow users to hear the correct pronunciation of each anatomical feature. The pin labels themselves now come with additional media, such as animations of anatomical movements or further images. There are also linked public notes which allows for users to read notes made by other users of the apps in the public domain. The images can be easily annotated, and shared with patients or other people who may wish to view them by email and social media via twitter and Facebook. The new dedicated apps are perhaps the ones of most interest to clinicians, for the first time including all of the relevant anatomy of the regions to give a clear picture of the entire anatomy from surface to bone. The clarity of images within these apps is outstanding, and the animations are especially helpful for explaining how certain muscles produce certain movements to patients. Structures such as the subacromial bursa in the shoulder can easily be visualised, and when combined with the animations showing movement at the shoulder joint, it is much easier than before to explain to patients how impingement of this structure can occur under the subacromial arch. You can check out the new features in the Knee Pro Nova video below (will only show on standard site). Having used the earlier apps during my patient consultations as an educational tool, I have now started to use these new apps and have found them easier to use both in the consulting room and at the training ground than the previous incarnations. Patients seem to gain a better understanding of the anatomy relevant to their injuries or conditions when seeing the visuals, and the multimedia content really helps to bring functional anatomy to life. Perhaps future additions to the series might include videos specifically related to pathologies. Examples might be video image of an inflamed bursa impinging under the subacromial arch, a ruptured anterior cruciate ligament in real time, or the dynamic anatomy of a snapping hip. For now, however, these apps give clinicians an extremely powerful set of tools for patient education, and for learning anatomy. 14 Responses to Next generation of anatomy apps for learning and patient education here NOW!! Hot off the press news just in that 3D4Medical now have their new Foot and Ankle Pro app available on the apps store in addition to the knee, hip and shoulder apps. The Foot and Ankle Pro app is similar in quality and usability to it’s sister apps. Some other news from 3D4Medical – they are indeed formulating multimedia within the existing apps to demonstrate pathological findings, and these should be available within upgrades to the existing apps in the future. It is a nice app which will be good for patient info but I am stunned to see that there is no visualization of the meniscus!!! Demonstrating what and where they are is one of the most common interaction in a sport medicine clinic. Hi Richard. The menisci can be seen in the Knee Pro and Skeletal Pro apps, but not in the Muscle Pro app. You can search for them under the ‘pins’ search box, and you will be taken straight to the relevant images. An improvement to the Knee Pro app would perhaps be a transverse section showing both menisci. They are not so easily seen on the saggital view, and the ACL is also not seen on this view although the PCL can be seen. I will feed your comments back to the team at 3D4Medical. I am hoping that they will add animations illustrating how injury occurs to the menisci in due course. daily. I’d like to start a blog so I can easily share my personal experience and views online. Please let me know if you have any kind of ideas or tips for brand new aspiring bloggers. Thankyou! It is in fact a bit of work. I’d estimate about 10 hours a week. But well worth it! I’m sorry I don’t know the answer to that. genuinely understands what they’re discussing on the net. You actually realize how to bring a problem to light and make it important. More people ought to check this out and understand this side of the story. It’s surprising you’re not more popular given that you most certainly have the gift. thank you for those kind words, we really appreciate it.